In my research and investing I stress three things: people, structure and value. I look for companies that are controlled and managed by quality people, have corporate structures that align minority and majority shareholder interests and trade at valuations that are below fair value if not outright cheap. This post is about people, and specifically about one of Hong Kong’s most prominent and oldest family, the Hotungs. People are the most important aspect in business and I enjoy reading business biographies to better understand what characteristics successful leaders have that may help me evaluate today’s CEOs and controlling shareholders. I bought the book to gain insight into Sir Robert Hotung Bosman, one of the wealthiest people in Hong Kong if not all of China before its 1949 liberation. I’ve heard a lot about him over the years, but never really knew the source of his wealth, family dynamics, etc. Despite his notoriety, I never found a good book about him or his family. “Clara Ho Tung: A Hong Kong Lady, Her Family and Her Times”, written by his daughter Irene Cheng was the closest I could find. Clara Hotung was Robert Hotung’s second wife. Unfortunately, there isn't much information on Robert Hotung’s business dealings and how he became so rich. Between the book and Internet searches, he seems to have made most, if not all, of his money as a comprador for the Jardine group. The following paragraphs from another book provide a good background to the comprador system and Robert Hotung’s role in it. '…the comprador systems was crucial to the rise of Sino-foreign commerce in modern China. Named after the Portuguese word for "buyer", the comprador system originated in the late Ming dynasty but came to prominence in the early 1800s'. The late 1800s was perhaps the height of China’s opium epidemic, and Jardine’s is widely believed to have its biggest dealer. Although I’ve not seen any source directly linking the Hotung's wealth to the opium trade, it’s pretty clear that a large part, if not the vast majority, of the family’s wealth originated in some form from the drug trade. (Link to my blog post comparing William Jardine to the main character in the TV show Breaking Bad is here). This is likely true for many of Hong Kong’s old prominent families and companies. Hong Kong was founded in the 1840s as a legal place to store opium that was destined for China, where it was illegal (at least on paper). At one point opium contributed 22% of the Hong Kong government’s budget (see here). From the book and additional sources I got the impression that he invested most of what he made into property in Hong Kong, Macau and other places in China. Hong Kong continues to be very property focused. While there isn't much here for the investor or business reader, the book is nevertheless an interesting read. It describes growing up in a traditional household when China was undergoing tremendous change. Although mixed, the Hotongs considered themselves Chinese and provided lots of funds and support to Sun Yat San and modern China. Many of Hong Kong’s oldest schools and institutions were started or initially funded by the Hotungs. 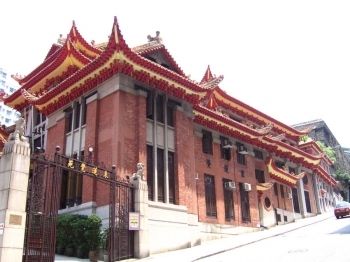 Amongst their many charity works are the Lady Hotung Hall at Hong Kong University, the Hotung Secondary School, the King George V School and the Tung Lin Kok-yuen Buddhist temple in Happy Valley. The website of the Robert H.N. Ho Family Foundation, run by Robert and Lady Clara Hotung’s grandson can be linked to here. Wealthy and powerful, the family’s disputes and internal squabbles are often public and they are they favourites of Hong Kong's paparazzi. The latest has the patriarch's oldest son, Eric Hotung, disputing a deal that was made some 50 years ago with his cousin (link here). Like other book reviews I’ve written, I’ve cut and pasted portions from the book that I think are especially interesting. 'He also bought a house in Shanghai during the 1920s. There was a large lawn and vegetables patches at the back.' ‘...Father also bought a house in the beach resort of Tsingtao (Qingdao)’. ‘Lastly, there was a house in England at 18, Mortlake Road, Kew Gardens. The house stood in large grounds which included a lawn in the front, with roses, a mulberry tree and flower-beds; and a tennis court, garage, vegetable gardens….’. ‘Father acquired several boats’. Changing times. 'I have often felt that among the Chinese, Mamma’s generation and mine have been hardest hit by the rapid social changes that took place during our lifetimes’. ‘She had come from a refined family and so had bound feet’. Changing race relations. 'In the late nineteenth century and on into the twentieth, there was considerable social prejudice against Eurasians from both European and Chinese. This prejudice made many of them the more determined to "make good"....Their best course was to make a lot of money, for with wealth came power and prestige.' 'They were also determined that after they had attained this objective they would contribute generously to local charities and to worthy causes in both countries of their heritage'. 'Except to conservative Chinese or Europeans it simply is not important anymore'. 'Their numbers have grown considerably by intermarriage and it is well recognised that many of the most successful people in Hong Kong are Eurasian, so it is no longer felt to be a handicap to belong to this group, even though it remains a small minority. 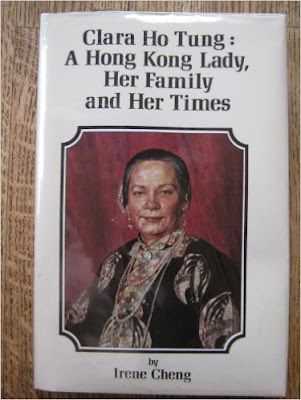 'We had three parents: my father, Sir Robert Ho Tung, my mother, "Lady Clara Ho Tung", and Father’s first wife, "Lady Ho Tung", or "Lady Margaret", who was childless. In accordance to Chinese tradition, she herself arranged for my mother to be also married to Father, as a "ping tsai" or "equal wife". We children were taught to call our mother, ‘Mamma’ and Father’s first wife, "Mother".